As we get closer to Christmas day, we delve deeper into the world of eggnog, gift buying, and parties. The holiday season is a very popular time for parties, one theme that is beloved by many is the "tacky Christmas sweater" party. If you are stressed looking for the perfect sweater, Downtown San Marcos can help you find what you are looking for. We here at Main Street went and visited a few so you can get an idea of what sweater you might want to get for any tacky sweater look you might be going for. 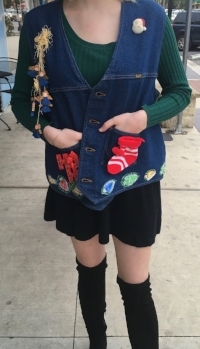 This beaded snowflake vest is more of a low-key "tacky sweater," so that you can keep it tacky but classy. This fur trimmed cardigan is the perfect mix of tacky and classy. Its embroidered nutcrackers and poinsettia buttons are just boisterous enough to qualify as "tacky" while not being too over the top. For some, spending money on a sweater you can only wear during the winter maybe once or twice just isn't ideal. We've found a few sweaters that you can wear throughout the season, party or not. This knitted sweater is perfect for a tacky sweater party, with its shout out to one of the original Christmas tales, but just cozy and cute enough to wear as an extra layer for other occasions. This quirky take on an Elf would be a hit at the tacky sweater parties, but is great for a casual winter look any other time. Price: Listed at $25.99, but it's also on sale at 20% off, so the final price would be about $21. Occasionally there's a tacky sweater party where a prize is awarded for the most tacky sweater. We've found a few options that are sure to guarantee you a prize, and at the very least make you the object of everyone's conversation. Emblazoned with bows, snowflakes, and a festive little bear, this patterned sweater is sure to get you the attention you deserve. Price: Listed at $16, but it's on sale for 50% off, so the final price is a steal at $8. This sweater was just so crazy that we had to show both sides. You're sure to steal the scene with this wreath decorated vest. Bonus points: it lights up and sings. Price: This vest isn't actually for sale, but you can rent it for the weekend for $50, with a $25 deposit. No matter which look you go for, any of these options are great for a tacky sweater event. Each of these can be found at one of the local downtown businesses listed, so you'll be supporting your small shops as well.